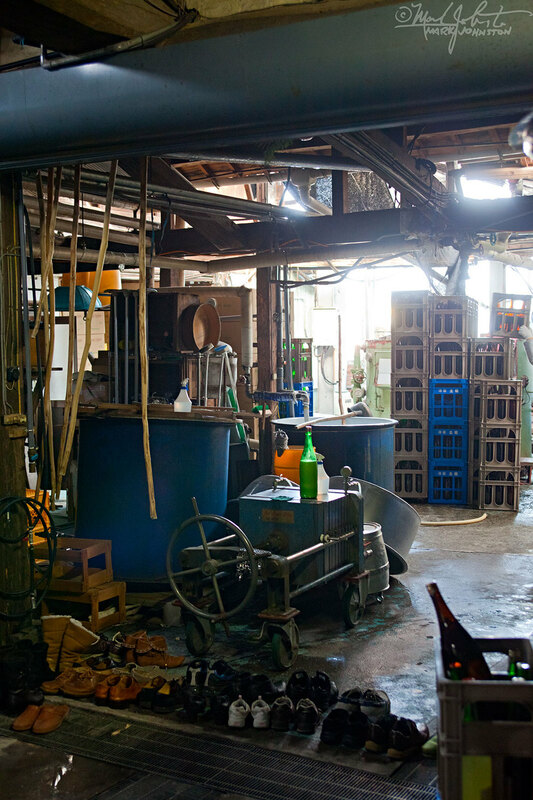 Inside the Kame Izumi [亀泉] sake brewery, Kochi Prefecture, Japan. Link. Published on April 02, 2016 by Mark Johnston. I've lived in Japan for ten years, and am sad to say that I have never been further south and west than Kobe - only about 360 km from Ito - maybe 2.5 hours on the bullet train. Friends from the States often ask me if, since I live in Japan, I have plans to travel around Asia. I always say that there are still so many places I want to see in Japan, and I fly so often for work, I would rather just get on a train or a bus and go somewhere in-country. So last weekend's visit to Kochi Prefecture, in the Shikoku region was a new distance record to the south for me. The unassuming facade of the Kame Izumi sake brewery. But - - - magic happens inside! The inside is rather unassuming as well, now that I think of it. Almost every year, a group from my favorite pub in Tokyo visits the brewery of one of Japan's best makers of "nihonshu" - what most people would just call "sake". We do a tour of the brewery, try some of the results of the brewmasters art, and have a great dinner together before heading back home. This year, we visited the Kame Izumi ["Turtle Spring"] brewery. After one-hour flight from Tokyo's Haneda airport and another hour on the bus, we arrived at an unassuming cluster of old buildings nestled up against the hills that lie between the town of Tosa and Tosa Bay. The "toji" or brewmaster, Saibara-san, met us outside and ushered us into the brewery. It was dark and cool inside, and you couldn't tell where one building ended and another began; all a maze of tanks, filters, and hoses among the old wooden beams and trusses. Shafts of afternoon sunlight flowed in through the windows and cracks in the planked walls. We have to take off our street shoes and put on slippers when stepping across the threshold to the "inside". Nothing big enough for my size 11-and-a-half feet, so the slippers end at the beginning of my heel. Saibara-san shows us around, explaining all the way. I have been asked to take photos, so I linger a bit behind, and wait for my co-travelers to move ahead in the narrow spaces, so I don't get to hear a lot of the explanation, and some of it would be beyond my poor Japanese language comprehension skills anyway. 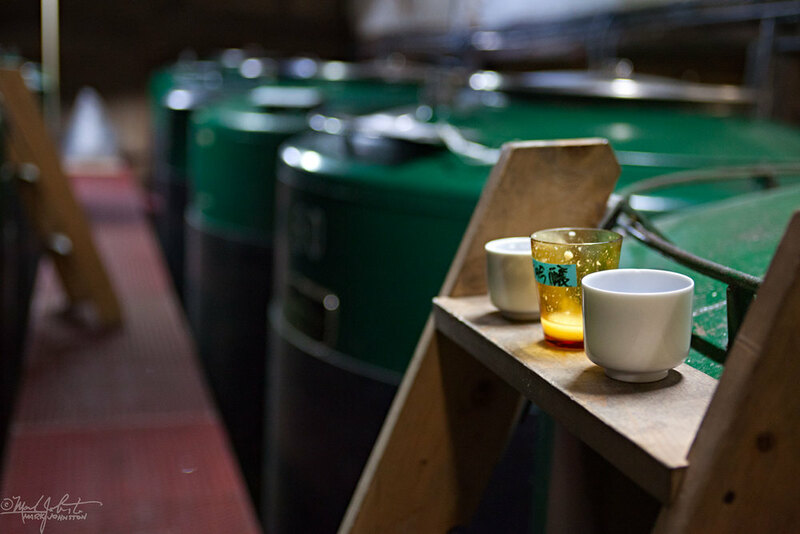 Tasting is critical to monitoring the brewing process. The "toji" or brewmaster of Kame Izumi, Saibara-san, wafts some air from one of the brewing vats. Near the end of the tour as we circle back from whence we started, Saibara-san leads us to a dual row of tanks, where the latest vintage is fermenting. Climbing on top of one, he gestures for us to use our hands to direct some of the air wafting out of the tanks and towards our noses. From a tray of small glasses, he taps off some samples and we get a taste of this work-in-progress. Its very fresh and lively, with a tang like new cider. A tasting session of various styles of product. Then at the end of the tour, we gather round some makeshift tables and sample a dozen or so different sakes. Just a warm-up for the awesome dinner we had together later in the city of Kochi [photo aobve left]. 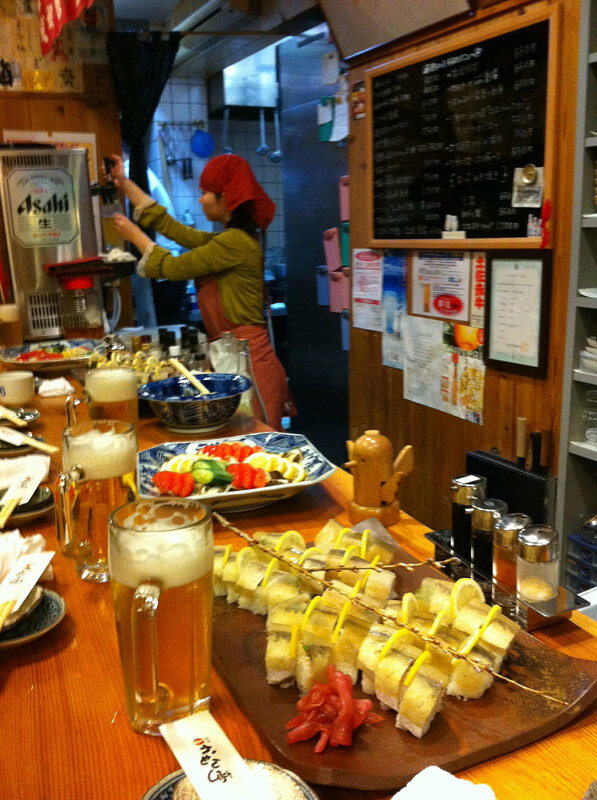 Small "Izakaya" [literally, "a shop with alcohol", but perhaps more accurately translated as "pub"] like this are one of the best things about Japan. If you can learn a bit of the language, and take the time to build relationships, you can settle into some amazing food, drink, and hospitality. A side benefit for me was a chance to check out Kochi Castle, which is one of the few castles in Japan that is not a post-war replica. The original castle, completed in 1611, burned to the ground in 1727. The current structures were completed in 1748. I managed to NOT stay out all night drinking, and was able to get up and walk the half-mile or so to the castle grounds, with plenty of time to make a lap around the castle before the sun came up at 7 AM. It was cold and I had not brought a tripod with me, so I had to do the best I could in the weak morning light, propping the camera against a rock, a tree, or a fence post. Maybe some day I can come back a really do it right, but I was glad I had the chance to see this magnificent castle. 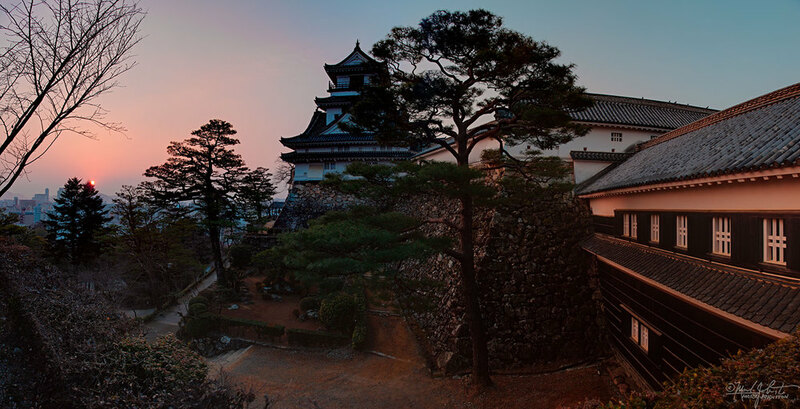 The main keep of Kochi Castle sits on a hill, and looks across fortified walls and moats into the town of Kochi below. Link. Published on February 11, 2011 by Mark Johnston.